In response to a thoughtful Denver Post column by SE2’s Abigail Kesner on the lack of civility in today’s political environment. Turner PR has added Asia Transpacific Journeys and the Albuquerque Convention & Visitors Bureau to its roster of travel and hospitality clientele. Turner PR will provide strategic media relations for both organizations focused on increased awareness in the national media marketplace. Elevator consulting company Lerch Bates has hired JohnstonWells to conduct public relations efforts on its behalf. Lerch Bates is headquartered in Littleton and has consulted on elevator construction and operations in many of the world’s tallest buildings. How is The Denver Post Doing? It all depends on whether it can monetize its “digital” readers. The latest Audit Bureau of Circulations numbers were released today, and over the past year The Denver Post has lost another 12.6 percent of its print subscribers. 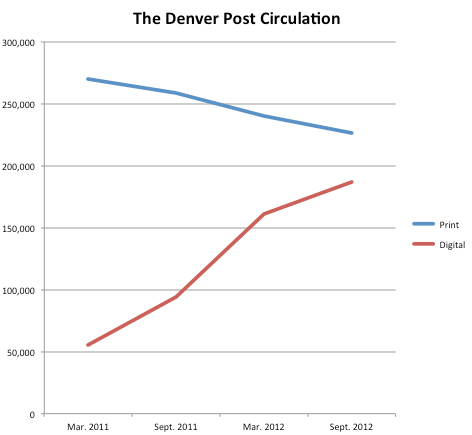 However, digital subscribers nearly doubled, allowing the Post to claim strong overall circulation growth. At this rate, The Denver Post will have more digital subscribers than print subscribers by the next ABC reporting date in March 2013. 9News anchor and investigative reporter Kyle Clark made headlines locally and nationally on Friday with his interview of President Obama as part of a satellite media tour. Clark’s questions – on the U.S. consulate attack in Benghazi, Libya; stimulus money for the politically connected, Colorado-based Abound Solar; and the lack of civility in the Presidential race – represented a departure from the softball interview questions sitting presidents usually face in local markets. Kyle graciously agreed to answer some of my emailed questions about the interview and the wide-ranging reactions to it. Q: How was the decision made for you to be the one to interview President Obama? A: As I understand it, the interview was offered to 9NEWS by President Obama’s campaign and our news director, Patti Dennis, asked me to conduct it. I’m not sure why I was selected; I’m not our political reporter, but like any player called off the bench by the coach, I just tucked in my jersey and hit the court. Q: You have developed a reputation for asking hard-hitting questions, particularly as part of the 9Wants to Know investigative team. Did President Obama’s team push back when they learned you would be the one asking the questions? A: I’ll be sure to mail you $5 for saying that. If President Obama’s team pushed back about me conducting the interview, I never heard about it. Q: How did you prepare for the interview and select the questions you would ask? A: I’m a political junkie who follows the campaigns pretty closely so I had a good idea which issues the candidates had already addressed head-on. We have no shortage of canned political messages on-air in Colorado, so my goal was to ask timely, tough, and fair questions that would elicit previously unheard answers on critical issues like Libya, the use of stimulus money and the tone of the race. I wrote out questions the night before the interview and ran them past about 10 people at 9NEWS to ensure that they were fair and addressed issues of interest. The morning of the interview, I adjusted our question on Libya to reflect recent comments made by Secretary of Defense Leon Panetta to the Associated Press. Q: President Obama’s answers were perhaps a little longer than you might have expected. What were the next two questions you would have asked him if you’d had the time? Among those hiring this week are GBSM, Catapult PR-IR, RTD, Banner Media Group, Denver Water Department, TeleTech, Adams County Government, Downtown Boulder Business Improvement District, The CELL, The Denver Scholarship Foundation, The Colorado Springs Gazette and Swift Digital (Vail). Public issues, policy and social marketing firm SE2 has promoted Brandon Zelasko to the position of Director of Interactive Services/Unofficial Futurist. Eric Anderson offers the details.